In order to cater to the rising demands for home furnishing products, Richa Group ventured into this sector with a commitment to excel. 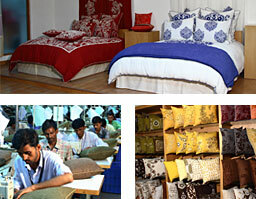 This division offers a new dimension to the Richa Group to further expand its business empire. Armed with an experienced and dedicated team of professionals, the home furnishing division is catering to the needs of clients, delivering world-class products of the finest quality, at reasonable rates. Over the years, the division has developed an excellent infrastructure essential for producing home furnishing products of international standards. It procures raw materials from reputed vendors in order to maintain the best quality in all the products. Cutting-edge technologies play a major role in the manufacturing process. Richa Group has taken all possible steps to equip the home furnishing division with the latest technologies and the best of expertise. The dedication of the professionals and satisfactions of the customers have brought success for the home furnishing division in the markets across the globe. It is growing at a remarkable pace bringing out more and more unique products in the market.